← Paris Vacation rental…will all go well? Rue Delambre was the name of the street where I rented my vacation apartment in Paris. It was perfect! It had everything I could have imagined and more. It was located up a quiet side street in Montparnasse between the 6th and 14th arrondissments, a very lively residential area of Paris. What attracted me to this part of the city was the fact that it was located on the left bank where intellectuals’ artists and writers of the past met lived or worked, like Picasso and Sartre. 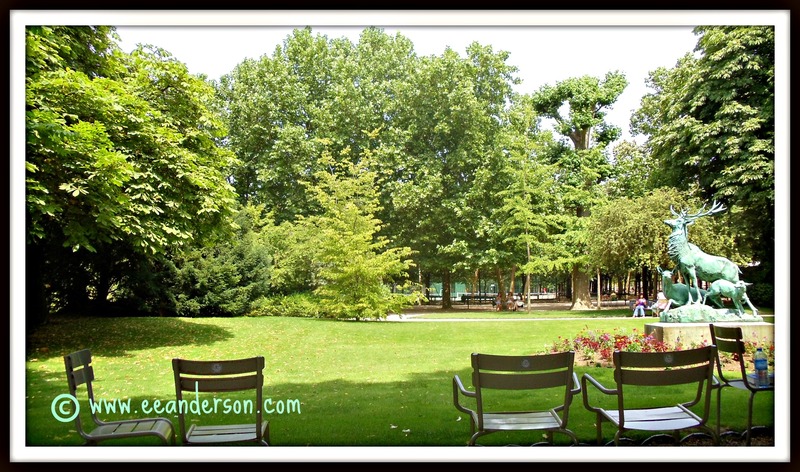 It was a short walk to the beautiful Luxembourg gardens. There are many cafes and restaurants, some very famous nearby. The Rosebud across the street was like stepping into the past. Le Dome was on the corner, La Couple on Montparnasse, creperies a few blocks away and Café La Rotonde not far. The American dingo bar now Auberge de Venise next door was the meeting place for Hemmingway and Fitzgerald. Fresh fish was available at Poisssonnerie du Dome, and a Nicolas wine shop and fromages delambre just below us. Yes, there was even art in the windows of the fish market! We also found rotisserie chicken, patisserie shops, a small grocery and street markets with produce. We dinned at Bistrot du Dome located across the street, a place where you find lots of locals unlike the famous Le Dome on the corner that mostly attracted tourists and was more expensive. On the way home from the park we stopped very often for some very delicious gelato. The area had great bus stops and the best metro connections. There are three main metro stops nearby, Vavin Metro number 4, Montparnasse-Bienvenue no12, which is a large station with many connections to other lines, and Edgar Quinet no 6. They got us everywhere we wanted to go as there were stops near most sites in the city. We had a pleasant walk around the cemetery Montparnasse. It was like a park with streets you could go through for short cuts to other areas. The tour Montparnasse was also within walking distance. The building is so high you can see it from almost anywhere in Paris. We celebrated our anniversary on the 56th floor in the restaurant Ciel de Paris with views of the Eiffel tower at sunset. There are many museums and points of interest in the area and if you wanted you could spend a whole vacation just exploring this section of the city. I would definitely recommend this area. This entry was posted in Food, France, Paris, Travel and tagged Edgar Quinet, Hemingway, Jardin du Luxembourg, Jean-Paul Sartre, Luxembourg, Montparnasse, Paris, Picasso, Sartre. Bookmark the permalink. Great photos! I will be in Paris from Friday, May 11 to 15; I love Paris and it is always a pleasure to go back……….. I am pleased that you enjoyed my photos. I wish that I would be in Paris when you arrive we could have met for coffee, perhaps another time. I too love Paris. What area will you be visiting? Please share your experience with us. I am in Paris right now! Staying in the Marais region. Lovely weather, lovely Paris, great art exhibits! Lucky you! Have fun and enjoy the exhibits. Your photos capture the magic of walking through Paris. How wonderful to be able to eat french foods AND eat gelato. I’m looking forward to reading more of your posts soon. Thank you. Walking,eating and taking photos in Paris is always a pleasure. Love this post! On my very first trip to Paris, our hotel was on rue Delambre. Indeed a great location and your words and photos capture it beautifully. Thank you. There are very nice hotels in that area, you were very lucky to have stayed in that location, I would definitely stay there again. How awesome was that vacation! I would love to have a little apartment in France instead of a hotel. I felt like I was there. Ahhhh… sounds lovely. You should try apartment rentals it really makes you feel as if you live there. When ever we travel now for more than a week we do this. There are lots of ways to get an apartment. We sometimes trade our timeshare and now we are starting to use home exchange. You made Paris come alive with your photos and description. Great job! Thank you for your comment. I love Paris.